THE BIG PICTURE: Governor Ige joined Hawaii Business editor Steve Petranik and past governors George Ariyoshi, John Waihee and Ben Cayetano at the Aug. 9 “Visions” event. Mention state government, and cynics see only bureaucracy. But Gov. David Ige sees the future. He has challenged state departments to modernize, innovate and make government work better for all of us. That includes tackling tough issues with aggressive goals to show results, replacing antiquated systems and saving taxpayer dollars. The goal? Measurable, visible progress to improve people’s lives. This issue of Capitol Connection focuses on some of the progress we’re seeing and the state workers who are making change happen. Q. When you became governor, you said you wanted to”restore the public’s trust in government.” Why is this so important to you? A. People in the community were saying they were concerned about the value they were getting for their taxpayer dollars. When I first took office, I talked to some of the state departments and could see we had good people working in not-so-good systems. They had become risk-averse because it was safer to not try anything new. I thought if we’re going to expect them to do more, we needed to modernize systems so workers could do their jobs better and feel supported. We’re changing our paper-based systems for more transparency and efficiency and to provide better service to the public. And we’re attracting more young people to public service who are bringing new skills and fresh ideas. Q. What kinds of progress are you seeing to improve accountability? Q. What other steps is your administration taking to make information more available and transparent? A.In addition to asking the state departments to increase community involvement, I have directed them to increase access to public information for greater accountability. Every state department is being asked to post a point of contact on websites for public records requests, in accordance with the Uniform Information Practices Act. We need to find the balance to comply with requests, handle costs and provide consistency. I’ve also begun Facebook Live segments for the public to ask other guests and me questions. Q. 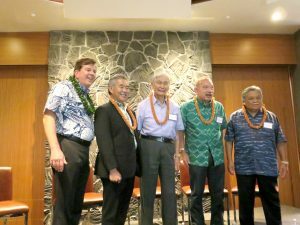 How does this progress fit with the “Visions for Hawai‘i” project published in Hawaii Business magazine?